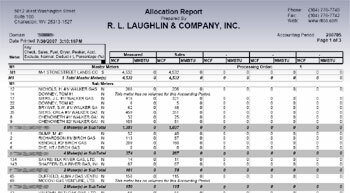 R L Laughlin has years of experience in simplifying an often complicated and expensive process: gas volume sales allocation. We've invested a great deal in the development of custom software that allows us to manage the sales allocation process quickly and accurately. From the very beginning days of the company, we have assisted clients with sales allocation and royalty distribution. Profitability is often determined by accurate production and royalty distribution and thus the precise and defined allocation for producers and well owners is a company priority.